This is the week that you will get to see my home! I admit that you are going to see some pretty embarrassing pictures of how messy my family really is. We used to throw things where they would simply fit. Then never pick it up again. I want to clarify that we were not a dirty family, but we were certainly messy. And lazy. 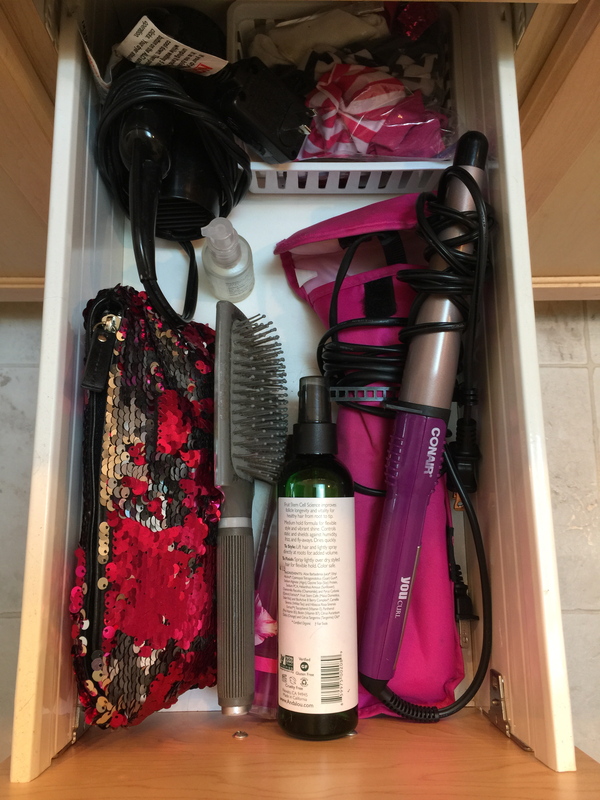 However, all of my before and after pictures will show you that anyone can become organized and stay organized. “Organizing from the inside out means creating a system based on your specific personality, needs, and goals. It focuses on defining who you are and what is important to you as a person so that your system can be designed to reflect that” (11). It’s important to identify what is working for you and what is not working. It is also important to try to figure out why it’s not working. Looking at my situation, it seemed that there were few things actually working for me. Then I noticed the hanging clothes in my closet. All of them were organized by sleeve length and organized again by style (formal, informal, t-shirt). Shoes in the closet were a different story, but the shirts and pants were perfect and had been for years. Then there were my pens. I have two cup holders on my desk. One houses pencils and basic pens while the other one holds colored markers and colored pens. The two are never mixed up. Ever. A system peeked at me from the edge of my desk and hope bloomed. I could be saved!!! 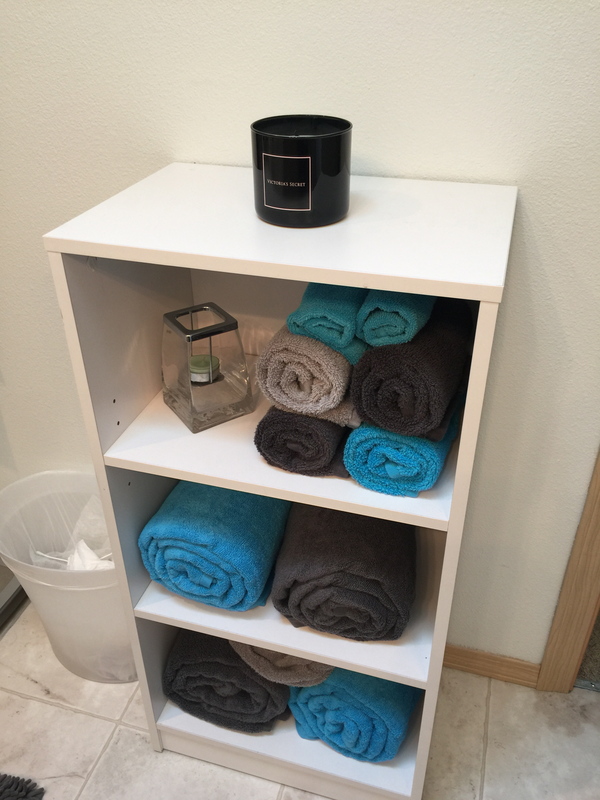 When I looked at what wasn’t working, I found that my biggest issue was simply lack of a specific space for each item in my home. When I wasn’t sure where to put it, it went on the kitchen table, on the floor in my office area, or in the garage. Creating a plan of attack was definitely needed in every room of the house. Underestimating time has always been a fault of mine, so I added an additional 30% to my planned time. I just wasn’t sure if I wanted to start with a room that was small or with a room that was really bad. 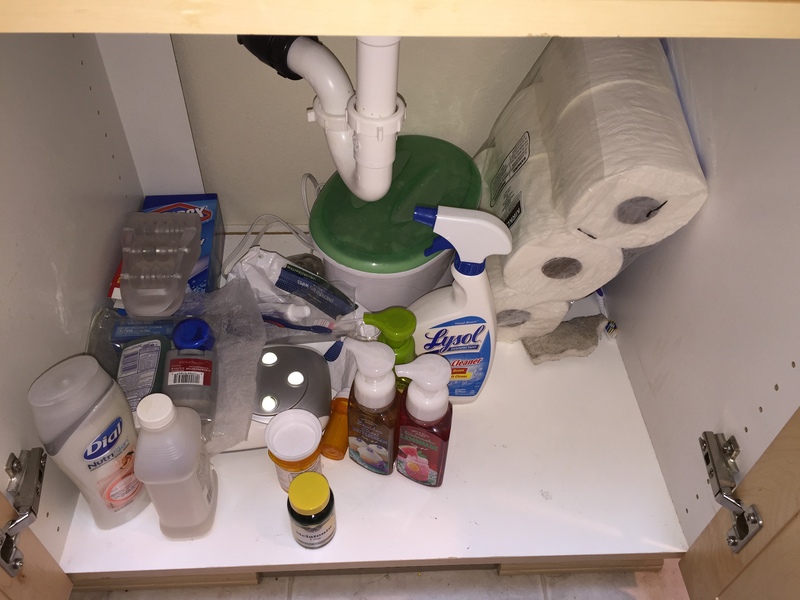 You can see that there was a lot of work to be done on just this small space (see below). Julie states that working on the unseen areas is a common mistake and that we should start with what is right in front of us. This totally makes sense to me. I can’t count the number of times that I decided to clean out a closet before cleaning the bedroom and became disheartened at the bigger mess that I had created. I had a beautiful closet that nobody saw and my bedroom looked worse than it did when I began. I didn’t want to run into that mistake again. 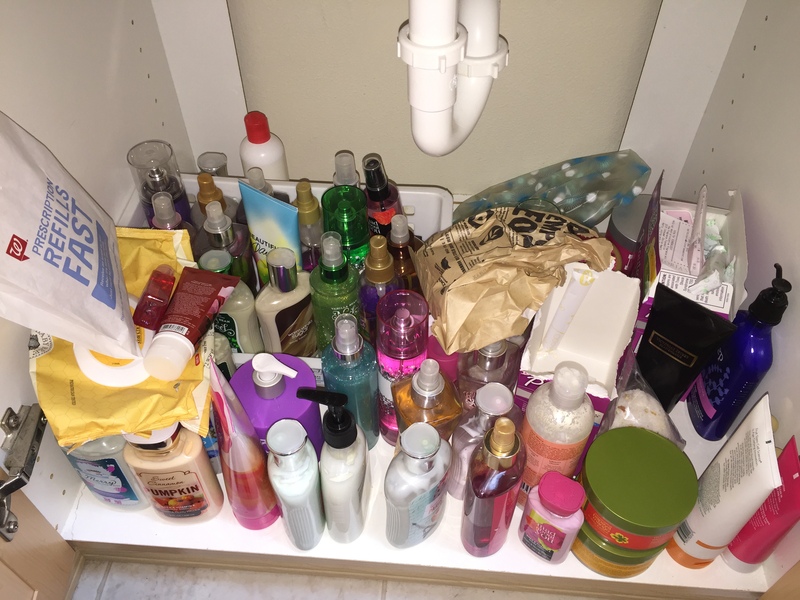 The first thing I did was to clean the bathroom from top to bottom, ignoring all the drawers and cabinets. Here was my bathroom when this project began. You’ll see I have random items that don’t need to be sitting on top of my counter. A can of Starbucks Refresher, a can of coconut water, sunscreen, and a whole slew of other items that needed to go into their proper spots. Then I got to the drawers and cupboards. 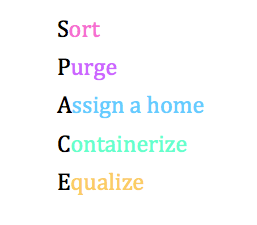 Here is the process of SPACE at work. I took everything out of the drawers and cleaned them. Here are my two drawers before I took everything out. I do want to let you know that my bathroom took 3 hours. I know. It was a huge chunk of my time, but it was sooooo worth it. 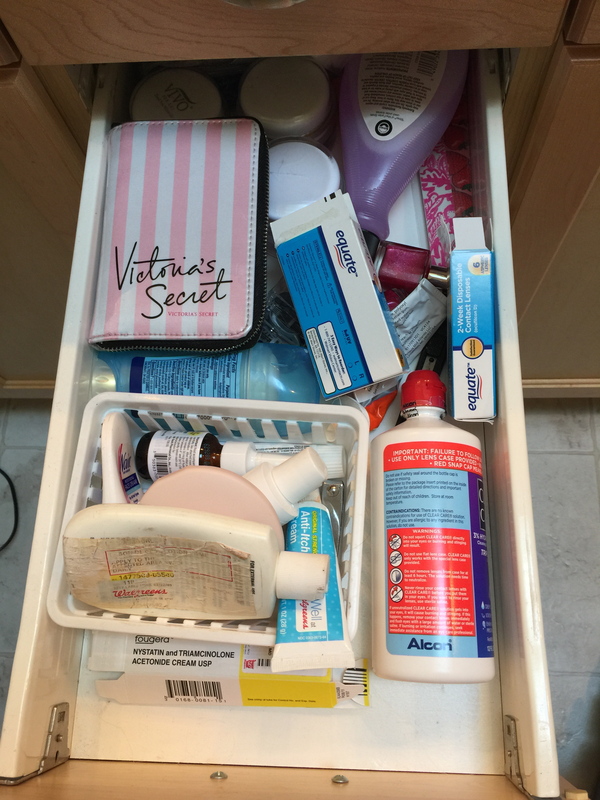 Everything has a spot, so there is no more leaving it on the counter. I’m now to the E of SPACE. Julie says the E stands for Equalize, but it’s just a fancy way of saying evaluate your job and see if it’s working. 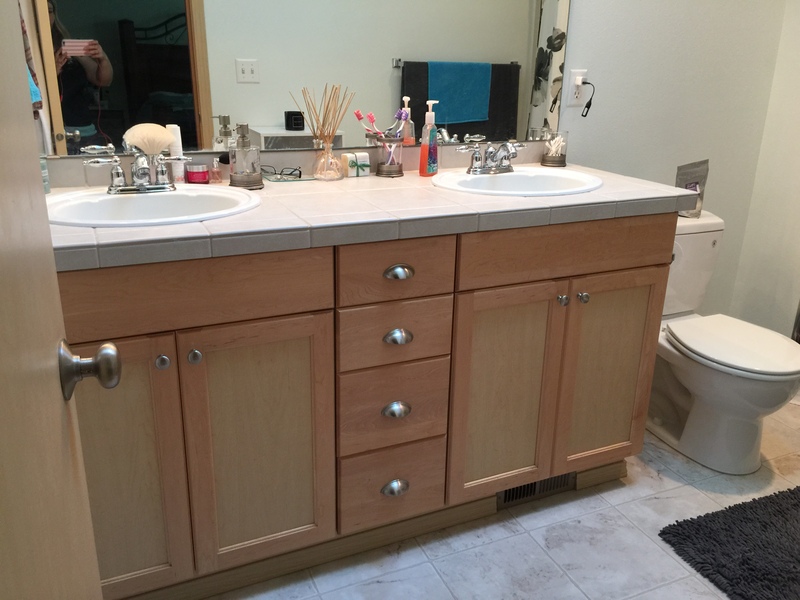 You’ll be happy to know that it’s been three weeks since I worked on the bathroom, and it still looks just as pristine as it was the day I did it. Anyone can organize and keep it clean. If I can do it, so can you. Regina Leeds, author of One Year to an Organized Life, has a few great ideas about getting rid of some of your unwanted items. She suggests having product swap party or donating. She warns about giving away used items. 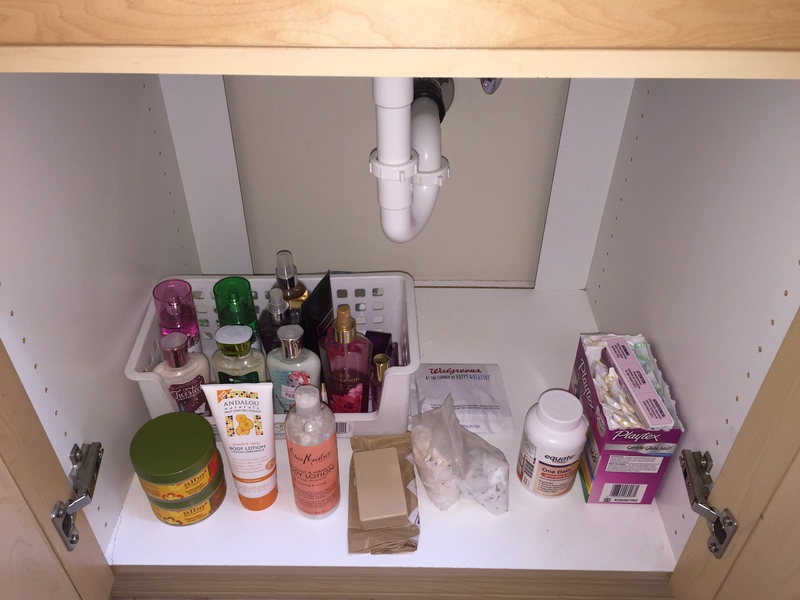 She also suggests that you can arrange the containers in your space to help organize for your morning routine. I did not do this, but I do plan the night before. I make sure to look at my calendar, and I put all of my clothes for the next day on the bathroom counter. Regina has a little different organizing style than Julie. Each section of the house takes four weeks. If you purchase the book, you will do some journaling and think about why you are the way you are and why you do the things you do. Their version of SPACE is similar, but Regina suggests reinventing your space to make it one that you absolutely love. In Week One, you will journal. 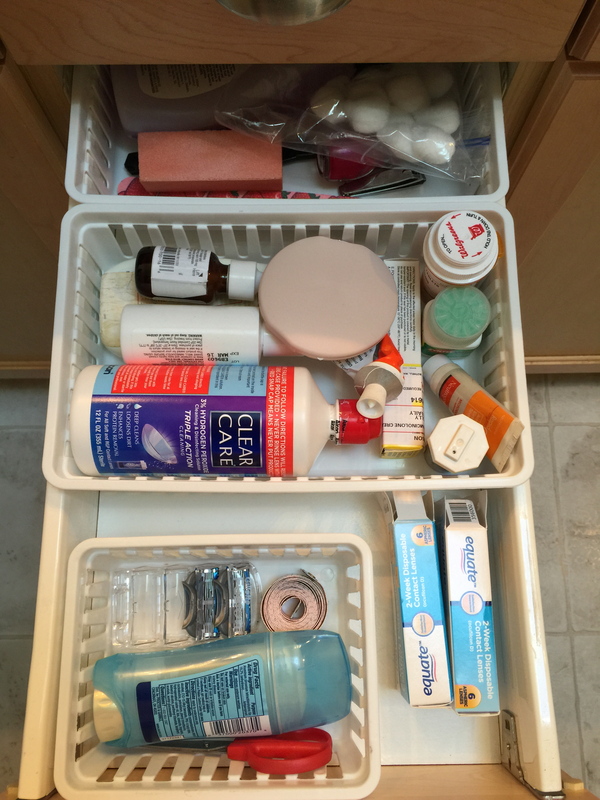 Week Two is about organizing, purging, and cleaning. Week Three is reinventing the space. 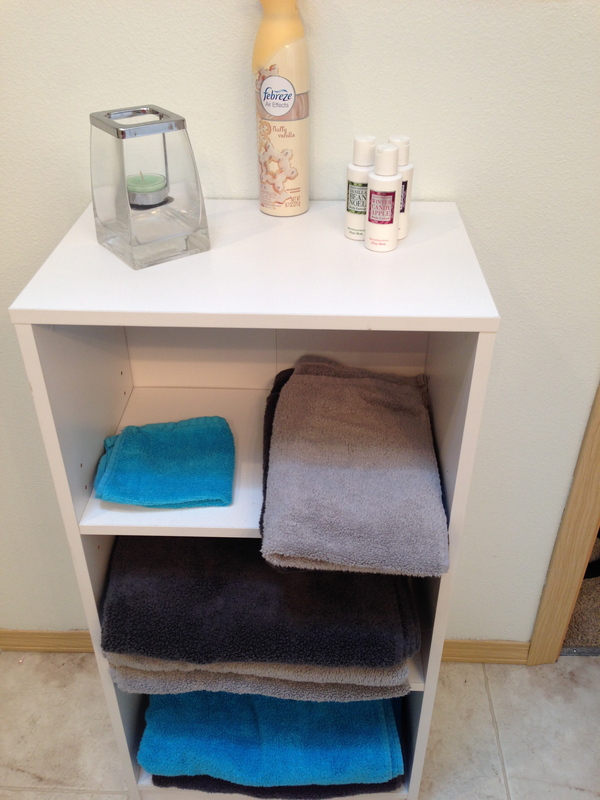 And Week Four is about turning your bathroom into a personal spa. I’ve completed Week One, and you just saw pictures of Week Two. Weeks Three and Four are going to be combined together. I have plans to make my own lotions and bath salts which suit my lifestyle. I prefer all-natural items, and I want my bathroom to have a spa feel. This is the room that greets me in the morning and gets me in the right mood. Hopefully you’ll see the end result by the end of this weekend. We’re going to move to the bedroom and closet once the bathroom is done. I’m not going to lie… the bedroom is basically done. I’ll make sure I take pictures of what still needs to be taken care of, but it was so much worse before I worked on it earlier. 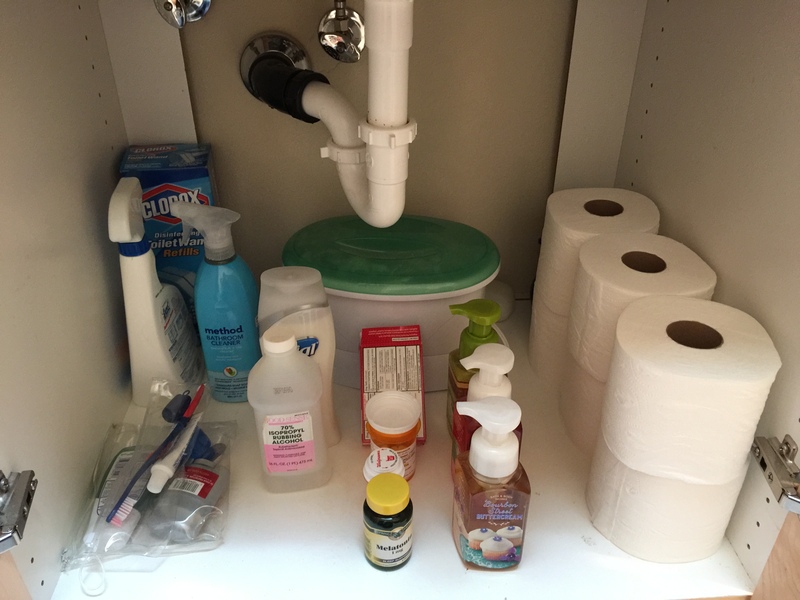 For now, get started on that bathroom! Make it a place of peace and relaxation. Don’t waste any time. Get your CAN out and put your bathroom on your to-do list sometime this week. Thanks for taking the time to comment, Dorothy. So far I haven’t had any issues with the hair or body products. Food, on the other hand, is a different story. I try to do a much better job of eating things that are better, and I certainly notice a difference when I do eat poorly. As for the cleaning of the other’s area, I’ve been pretty lucky with that one. While I do clean the bathroom, for example, my husband doesn’t leave any whiskers for me to clean up after. 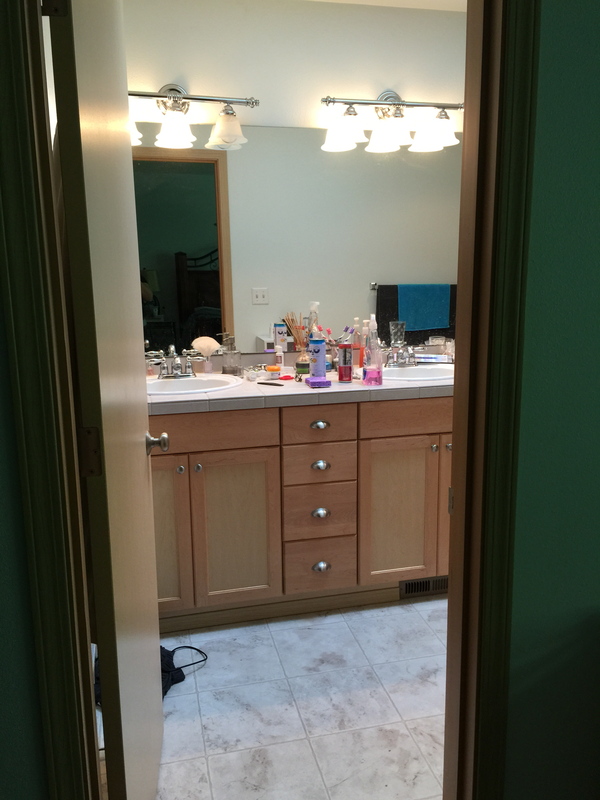 My son cleans his own bathroom and bedroom. I just have to monitor when he is done. After all, he’s a typical 13 year old boy, so his version of clean and my version of clean are definitely not the same. He’s catching on though.